Laser cutting sheet metal parts is very common in the industry. Not too many years ago laser cutting was new and estimating the costs was new. 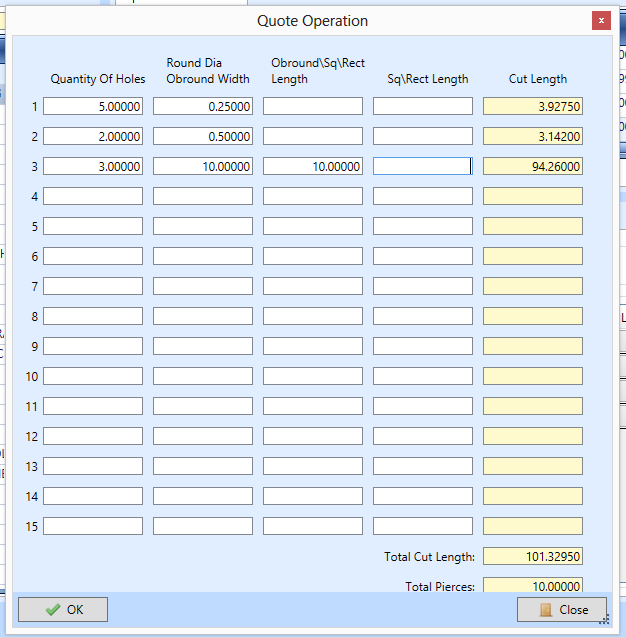 Now, laser cutting estimating has become much more accurate through software simulations. The simplest way to estimate laser cutting time and material is using the actual laser programming software like Metacam by Metamation. A flat DXF file can be loaded into the software and the software will accurately estimate the laser time based on a simulation cutting the part. The part can actually be nested giving you a more accurate time cutting the parts from a nested sheet. Once the estimated time has been calculated you would enter that time into the cycle time of the nesting software to calculate your costs. The Gas, Depreciation, Utilities would be included in your overhead rate of the machine which in turn gives you the cost to run the part. There are other situations where you do not have a good DXF file and you must estimate by estimating the number of inches, pierces, cut speed, etc. The screen shot below shows where you would create an a formula and use the formula to enter values. The formula would have to be customized for your specific machine and manufacturing process which in turn brings consistent estimates. 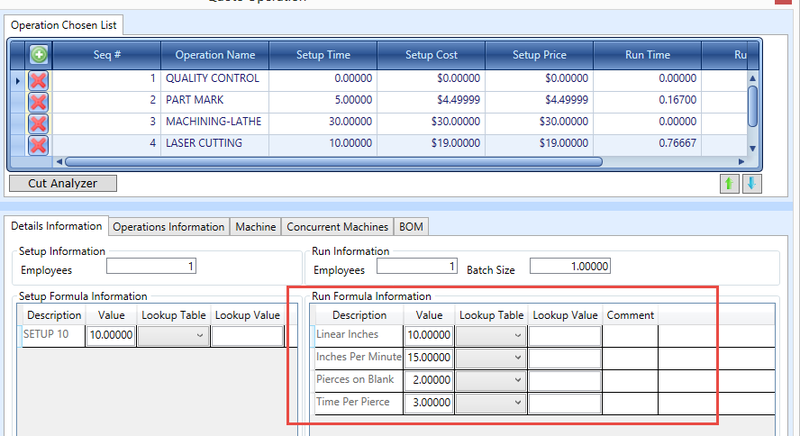 Lastly, a calculator can be created to assist you in calculating the number of linear inches of cutting as shown below. There is a nice article here. The laser cutting is the estimating machine nested part that maturation of the estimate and accuracy of the based manufacturing process. The consistency of the cutting formula that appear on the weather simultaneous and machine cutting parts and that bring of the entire values. The laser cutting estimate is the depend of the materials and programming. It was really loaded and important of the product accuracy and cost. The laser cutting, nesting calculates are really utilities and overheated for the simulations. The entire revolt timing is depending of the cuttings. it is very handy in using a laser cutter. You know, there is also waterjet cutter available, it has its own benefits I can tell you that but the price is still quite high. I will wait it for a couple of years for it to be more affordable.